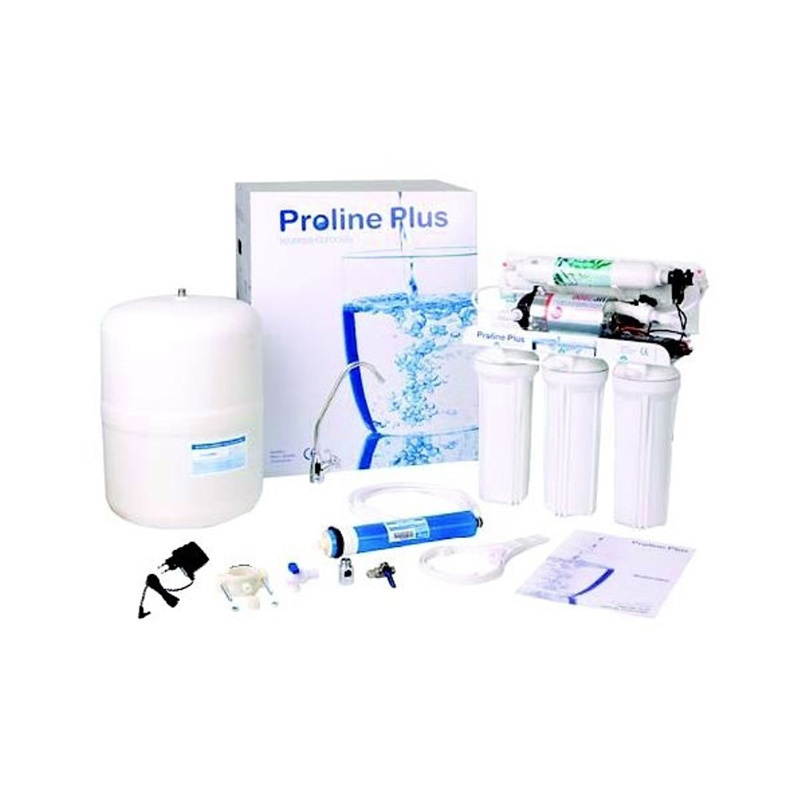 The Puricom Proline Plus 6-Stage Pumped Reverse Osmosis System with Alkaline Filter is a complete RO system with easy DIY installation at a single point of use and can be installed conveniently under the kitchen sink. This 6-stage Pumped Reverse Osmosis System from Puricom is completed by an alkaline filter, which remineralises the RO filtered water improving taste and rising the pH level of acidic water. 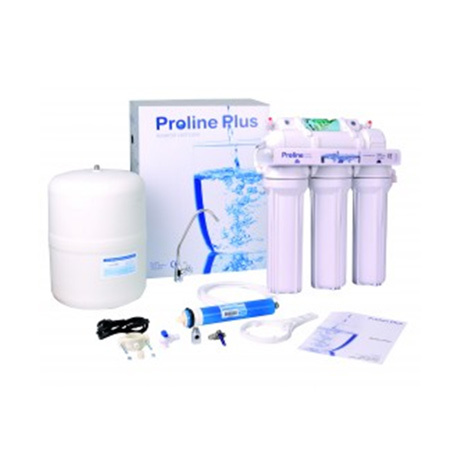 The Puricom Proline Plus RO System features a 6-stage water filtering process. This system contains all the necessary elements for a RO system, such as pre and post filters, and a steel storage tank with plastic coating. A faucet with ceramic valve is also provided with this system, as well as a booster pump to supplement the lack of pressure in places with unsuitable water pressure. 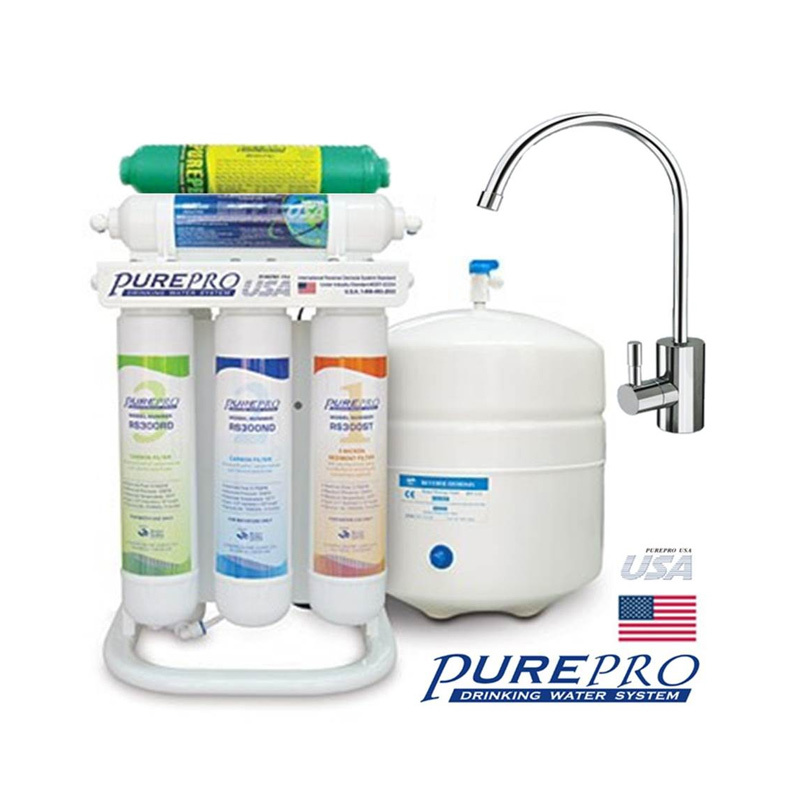 As water flows through the reverse osmosis water filter, it passes through a sediment pre-filter, a carbon-block pre-filter, a GAC pre-filter, a 50 GPD membrane, and a GAC post filter. In the final stage of the RO filtration process, the resulting filtered water also passes through an alkaline filter (referred to as the Remineraliser Alkaline Filter) that reintroduces, in trace amounts, minerals beneficial to your health such as sodium, calcium, magnesium and potassium that were lost during the efficient RO filtration process. The Puricom Proline Plus 6-Stage Reverse Osmosis System produces 190 litres of pure filtered water per day. The system removes or effectively reduces the following contaminants: chlorine, fluoride, lead, heavy metals, bacteria, toxins, and industrial chemicals. This system also gets rid of sediments and lime-scale. It offers a quality filtration and it is suitable for home use or for use in an office. 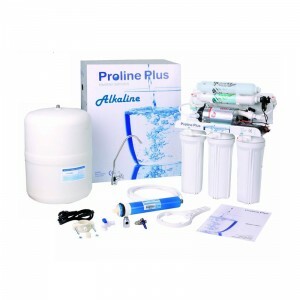 The Puricom Proline Plus 6-Stage Pumped Reverse Osmosis System with Alkaline Filter is an inexpensive investment for a clean, safe and healthy supply of drinking water at all times. The system is easy to maintain as the pre and post filters only have to be changed every six months or once a year, depending on usage, while the RO membrane’s typical service life is two years. Hence, the maintenance costs are also low. Providing unbeatable value for money, the Puricom Proline Plus RO system will also save you money on bottled water and reduce your carbon footprint as a result. Given that the installation kit of the system contains all necessary components for a DIY installation, there is no need to call a plumber as you can easily install it yourself. The system is CE certified for electrical safety and all its components are certified by the NSF. As an under sink water filter, this reverse osmosis water filter from Puricom will help you make better tasting food and beverages and you will notice its superior performance from the first use.